Disney has just released the IMAX 3D poster for Andrew Stanton’s John Carter, slated for theaters March 9. 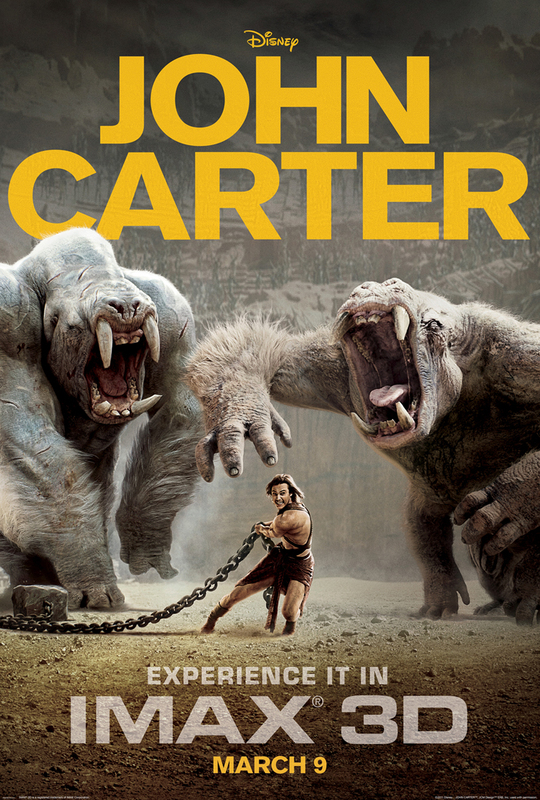 The poster features John Carter in rather dire straits in front of two Barsoomian Great White Apes. While not a central element to the overall story, the apes certainly make their point and imagining this in IMAX 3d is, well, invigorating. I was going to post some thoughts on the poster but Oliver Lytellton as PLAYLIST has already said pretty much what I would say about the poster. Here are his comments, which aren’t as negative as the headline implies, but do raise some questions about the Disney campaign so far and express the hope that a lot of filmgoers (this one included) have that Andrew Stanton has the Right Stuff to pull this off. One of the dicier blockbuster propositions of 2012 will also be one of the first to land — we’re talking about Disney’s mega-budget version of Edgar Rice Borroughs’ pulp hero “John Carter.” Everyone from Robert Rodriguez to Jon Favreau has tried to bring the character — a Civil War vet transported to Mars — to the big screen, but in the end, it was Pixar vet Andrew Stanton (“Finding Nemo,” “WALL-E”) who landed the job, with “Friday Night Lights” star Taylor Kitsch in the lead role. But for a while there, despite Stanton’s pedigree, things weren’t looking so hot. Disney’s marketing campaign has been a bit shaky, starting with dropping the ‘Of Mars’ from the title to make it as anonymous as possible (because a similar tactic worked out so well for “Hugo” at the box office…), an underwhelming teaser trailer, and some pretty opaque posters. We suspect we’re in the minority, but for us, things are starting to look up a little. We found the last trailer a vast improvement, and now a new poster has arrived, clearly meant to remind IMAX goers heading to “Mission Impossible: Ghost Protocol” this weekend that the film will be landing in the giant-screen format as well. And at the very least, it’s clearer than the last one-sheet as to what the film actually involves — namely, a shirtless man fighting a pair of albino gorilla/mole things. Puhlease! Stop it with the "John Carter is ripping off Star Wars"